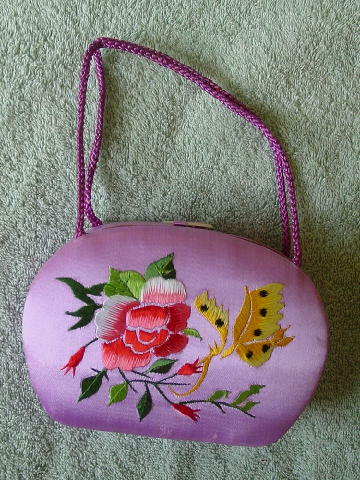 This (feels like satin) purse is in a light purple-lilac color and has two purple cord 12" long handles which are attached together in the center. The front and back have the same design pattern - an embroidered butterfly, flower, buds, and leaves in light and dark yellow, black, light and dark green, white, pinks, and red. It has a thin strip of fabric on the top with an ivory colored plastic cone-shaped closure which fits into a little fabric loop. Slide it out and the purse opens. 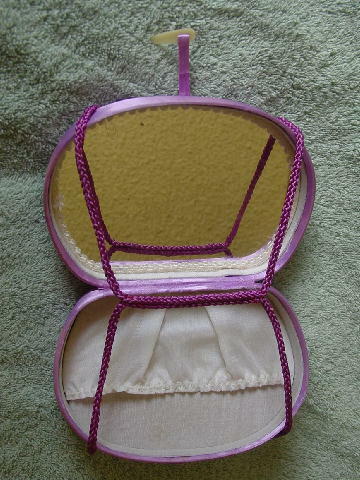 One side has a full mirror and the other side has a little white fabric 1/2 pocket. It doesn't hold much, but it is cute. The lower front and back and the sides have some snags, but we don't think they detract from its appearance.